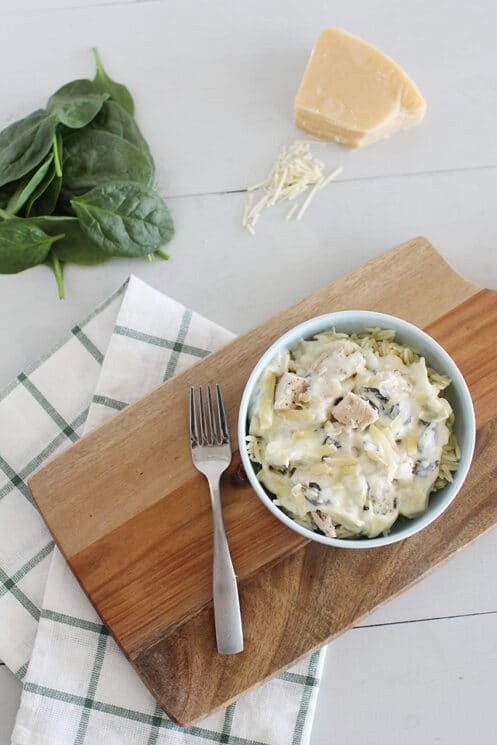 Fresh spinach, tangy artichoke hearts and savory parmesan make every bite of this Creamy Artichoke Chicken Skillet a dinner worth making for your kids. 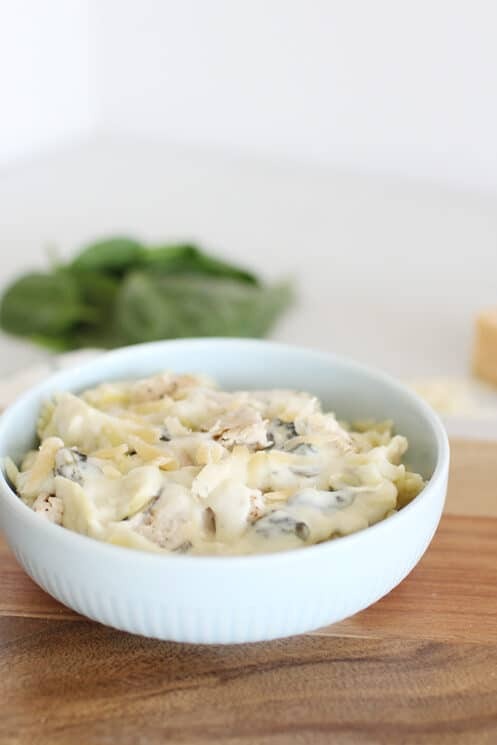 One of the most popular appetizer recipes on the internet is spinach artichoke dip. And one of the most searched dinner ingredients is chicken. 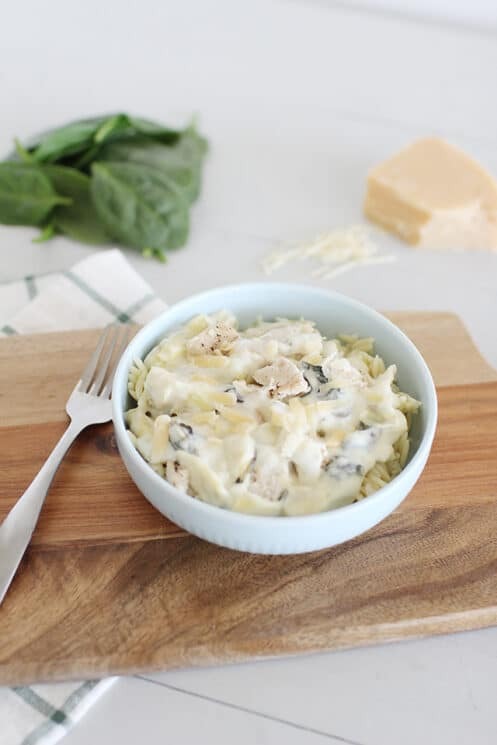 When you combine the two you get a really incredibly tasting dinner, and our version is not only full of nutritious ingredients, but it is a lot lighter than most other artichoke chicken recipes. Most of you reading this probably have young children and dinner needs to be something that is quick and easy to put together. We have found that skillet dinners are one of our fastest and easiest dinner recipes because you only use one pan and it cooks fast! 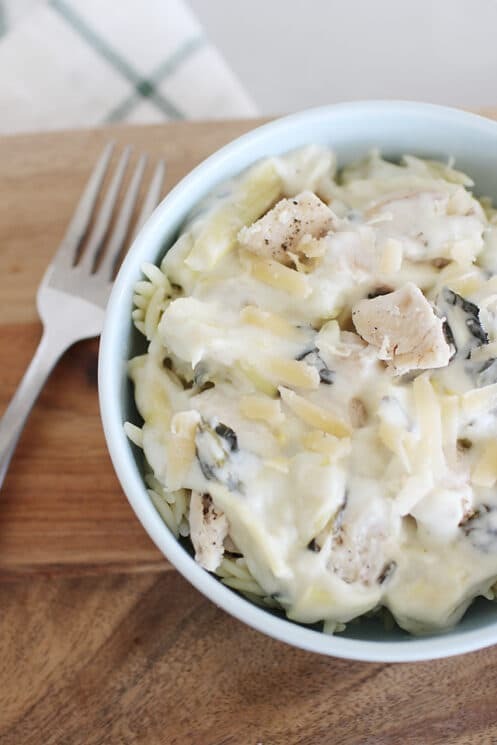 This artichoke chicken skillet is no exception. From start to finish, you can have this dinner on the table in 30 minutes with very minimal clean up! You can also make it earlier in the day, and put it back on the stove to warm up right before dinner. 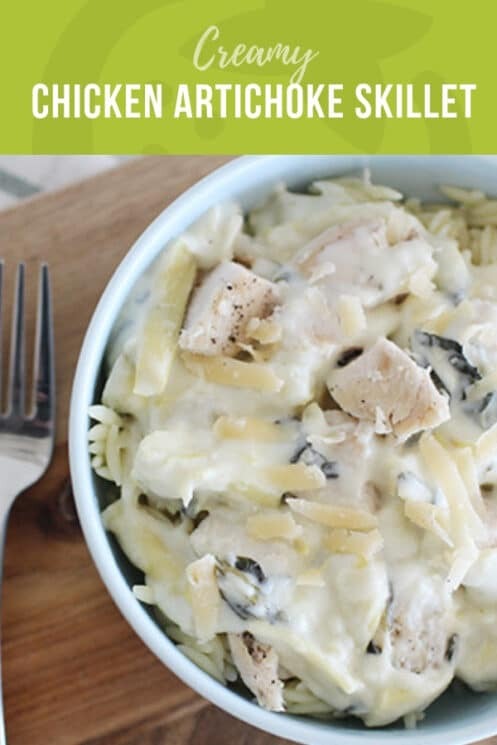 We like to serve this artichoke chicken over pasta and it is fun to switch up the types. 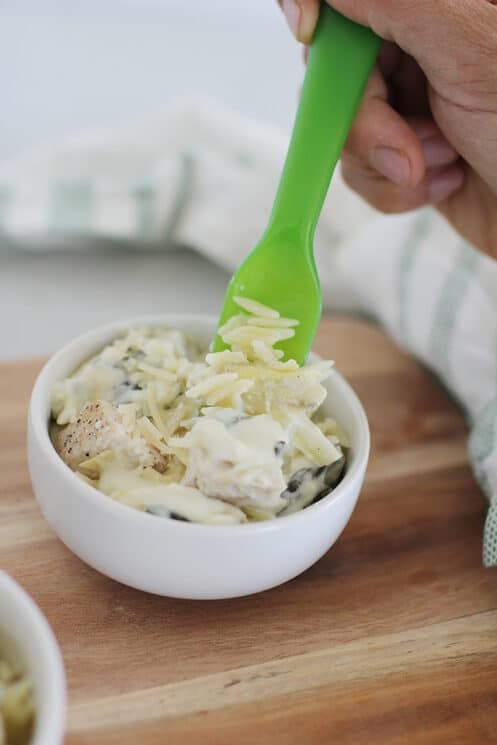 When we created this recipe we used orzo pasta which for kids probably seems like a cross between pasta and rice. The best of both worlds! A skillet (or frying pan, or frypan) is a flat-bottomed pan used for frying, searing, and browning foods. You can also simmer sauces and cook things a lot faster than a pot because it is much more shallow and distributes the heat more evenly. The best thing about a skillet dinner, is that the entire recipe cooks in the skillet. From the chicken to the sauce, you don’t end up washing 5 pots and pans when it is all said and done. We love making skillet dinners on busy weeknights because they are easy to prep, easy to clean, and you can serve the meal directly from the skillet it was cooked in. Remove the tip with the prickly leaf tips. Use scissors and trim the leaf tips. Is an artichoke good for you? The answer is yes! An artichoke is a veggie that is full of B-vitamins, fiber, Vitamin C and antioxidants. They are number 7 on the USDA’s top antioxidant rich food list. Why is chicken so popular? People really love to make chicken for dinner. It is typically less expensive that other types of meat, it has leaner cuts and more rich flavorful cuts, and it is incredibly versatile. Breasts, wings, legs, thighs, drumsticks, whole chicken, ground, and the list can go on. 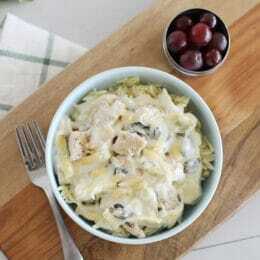 The most popular recipes on big recipe sites are chicken dinners. You can make nuggets, pot pie, soup, salad, chili, and about a million more recipes. And for us, the most important reason we love to make chicken for dinner is because it has high quality protein and kids usually like to eat it! Give chicken a more even cook time by pounding out to an even thickness by using a mallet or backside of a spoon. Season with salt and pepper. Generously spray a large skillet with cooking spray and heat over medium-high. Add chicken and cook for 4-5 minutes, until golden on both sides and no longer pink in the center. If chicken begins to stick, spray pan again. Remove from skillet and cover to keep warm. Using same skillet, melt butter over medium. Mince garlic and quarter artichoke pieces. Add garlic and flour to melted butter. Cook for 30 seconds while whisking. Add spinach and and artichoke. Saute for 1 minute. Pour in milk slowly while whisking and scraping the pan to remove any brown bits. Add cream cheese and Parmesan cheese. Mix and cook until melted. Add chicken back to the skillet; heat through. Season with salt and pepper, to taste. Really yummy! Two out of my three kids ate it. I made it with a rotisserie chicken enstead of cooking the chicken. Thank you for this recipe! Looks very delicious! Making it this week.